Lee Hydes Building Services is a Trust Mark endorsed trader, this means that our work and background has been assessed and checked to ensure that we are working to high standards and are proved to be trustworthy tradesmen. Click here to see our TrustMark page. Lee Hydes Building Services is an approved installer of 'Firestone RubberCover' EDPM flat roofing systems. 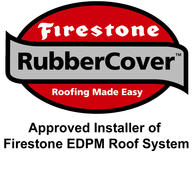 Firestone RubberCover is a low maintenance, hardwearing, sleek, 20 years guaranteed method of flat roof covering and expected to last 50 years. Lee Hydes Building Services in an approved installer of Freefoam Building Products, our work has been assessed and approved to be of high standard and excellent customer service. Lee Hydes Building Services has gained an 'OSCAR' certification, this means that Lee Hydes Building Services has been assessed and proven to work in a safe and sustainable, environmentally conscious way. This ensures that there are little/no material wastage, over ordering of materials, and considered disposal of waste materials. OSCAR also ensures that we are working safely onsite and with safety at the forefront of all activities.